I recently bought this magnifying glass and it did not come with a case. Well unless you have a case, you can’t toss it in a drawer without it getting scratched. 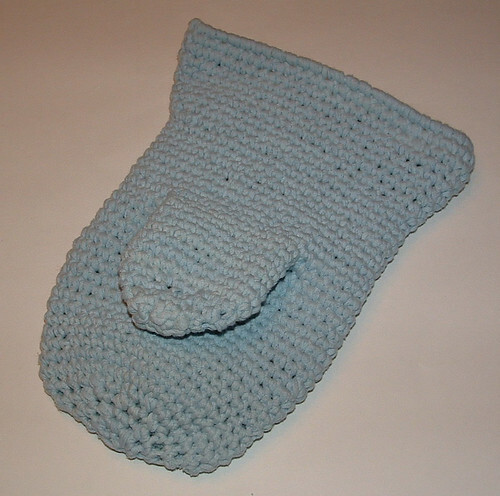 So I set out to crochet myself a little cozy to protect the glass. 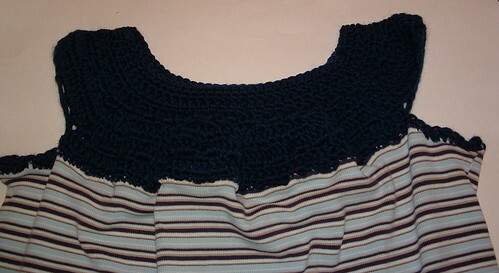 I wanted something stiff and protective so I used a ball of t-yarn that I had leftover from a tank top that I cut up. I cut my t-yarn or tarn only about 3/8 inch wide and then gently stretched it. 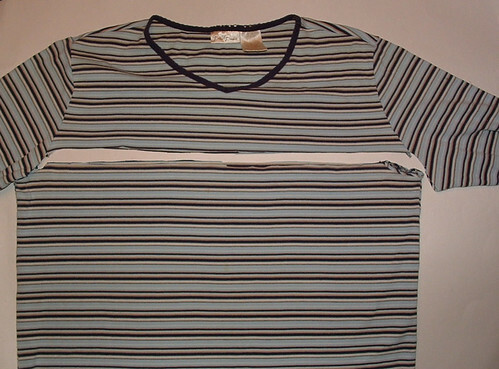 Here is my t-yarn tutorial for the details on how I prepare my t-shirts into a yarn material. I only needed a small ball of t-yarn for this project and believe it only required about half the front of the tank top to make this magnifying glass case. Here is another photo showing the glass as you pull it out of the case. 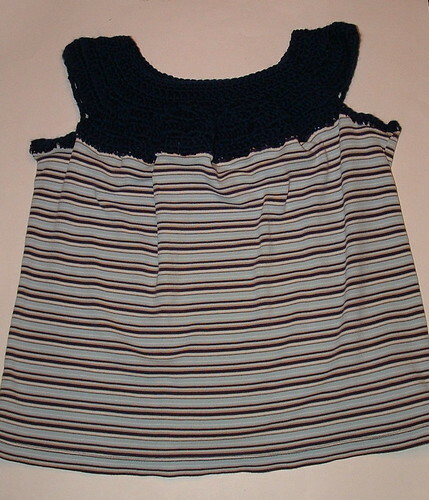 Because the t-shirt yarn is stiff, the glass doesn’t need a closure and stays put inside nicely as I crocheted my cozy with a snug fit. 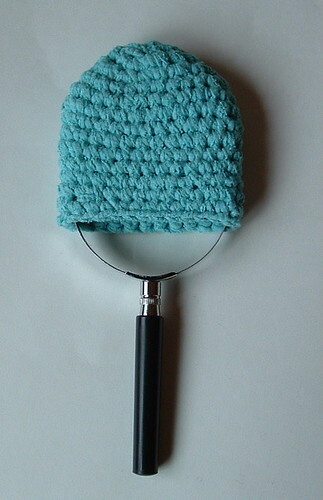 My magnifying glass is 3 inches wide and the pattern below is for a cozy for this size glass. Adjust your stitches for a smaller or larger glass as you work your increases at the beginning. I kept constantly checking my fit after the first several rounds. I worked this project in the round and just made sure the glass fit inside the cozy as I crocheted further. 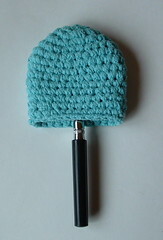 Once you reach the correct width of the glass, you work single crochet stitches evenly to finish. Hope this makes sense and email me if you have any questions as you work the crochet pattern. This project involves recycling those plastic six pack rings you get from cans into useful towel holders. The rings are cut apart and trimmed with scissors. You may not have noticed but once the rings aren’t around the cans anymore, they aren’t completely round. Using the shape as a towel holder worked out great. 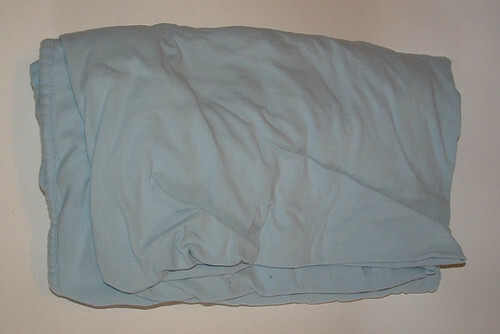 It has a natural bend in the ring which accommodates a folded towel over the ring. 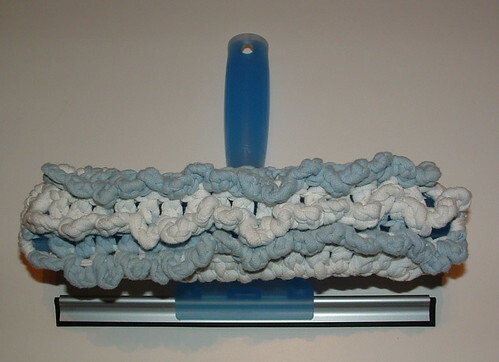 Of course I wanted to keep this a recycled crocheted project, so I used t-yarn or tarn to make this towel holder. 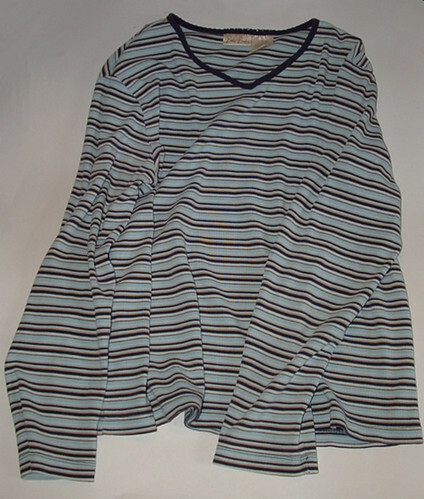 T-yarn is the yarn created from recycled t-shirts and cut very thin into strips to cover this plastic ring. 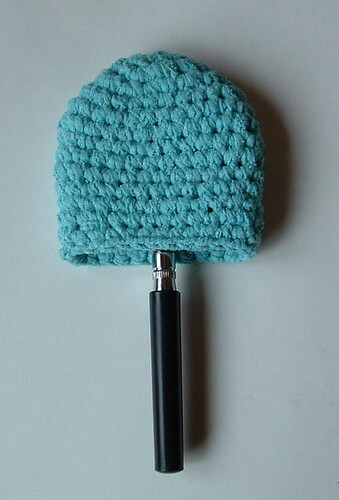 Once you crochet a few rounds, you can slide your towel handle around on the plastic ring. The last photo shows about where you want to place your center over the curve in the plastic so your holder is centered. I used a thin tea towel to insert in the ring as it fits better than thicker towels. 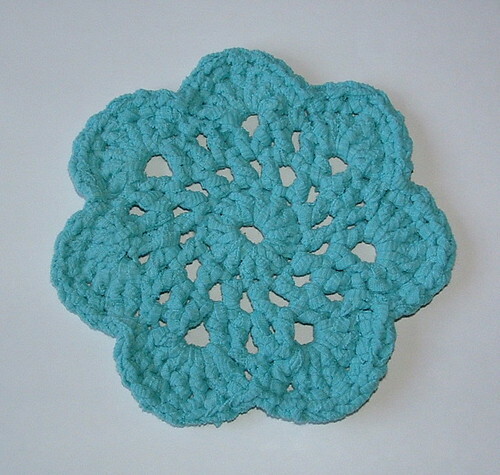 Here is the free crochet pattern below. Enjoy! 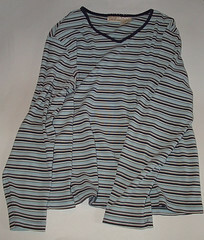 Here is my t-yarn or tarn tutorial on how to make yarn from recycled t-shirts.